Happy Star Wars week ONS Gamers! 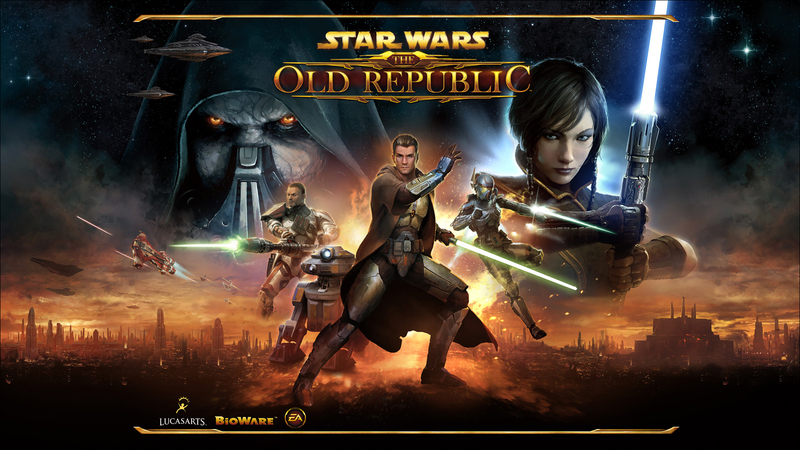 Tirc back to write about the most recent game and possibly my most enjoyed Star Wars game of all time, The Old Republic. Now before you flame me in the comments section or unleash rage let me clarify that I am stating that it my most liked, I’m not claiming that it is the BEST Star Wars game ever. There are a few reasons behind this that can give some explanation. Two of my favorite types of games are MMO’s and RPG’s… so naturally this had something going for it right up front. I also happen to love the universe of Star Wars, so it had quite a bit going for it there as well. I need to preface this article with a couple points. I got into this game fairly early on in its life cycle but I have not played it for about a year or so. I played a good bit of it when it first came out but have not played any of the post release expansions. This article will explain the game from a base level. It will give a good idea as to what to expect if you decided to pick the game up tomorrow. I won’t be covering late game concepts and content. I have played WoW since shortly after it came out, so I have about 9 years of mainstream MMO experience. That is just a small glimpse into my experience of the game, but I want to explain some of the aspects of the game and what I think makes SW:TOR shine as well where it is the typical MMO. The first time in game a very distinct realization hit me, there are no mods in this game. Mods enhance certain features in the game. Most of the time they take information that is behind the scenes and brings it to the forefront, for example damage meters which chart how much damage you are doing over time. Helpful things to know but not necessary to play the game. For me they felt kind of necessary after playing the last 6 or so years with a heavily modded WoW client I had to learn basic MMO UI functionality all over again. The next thing I noticed in game was area of effect (AOE) looting. This was one of the things that this game did that is so simple but had not been done in mainstream MMO’s yet and it was glorious. You often are killing mobs in groups so the ability to loot a whole group in one click was an excellent quality of life change from previous games I had played. 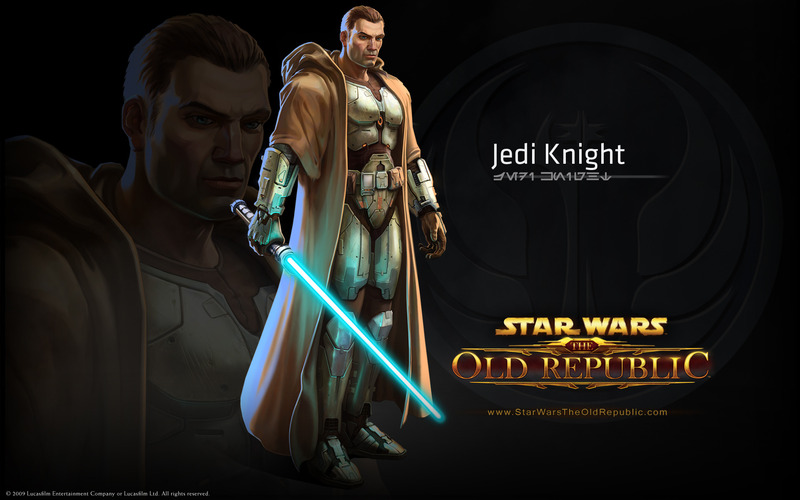 A feature very reminiscent of the Knights of the Old Republic games are the addition of the lightside/darkside points. When you make a story decision that is generally positive you have can gain lightside points and if you chose an outcome that can be considered negative you can gain darkside points. 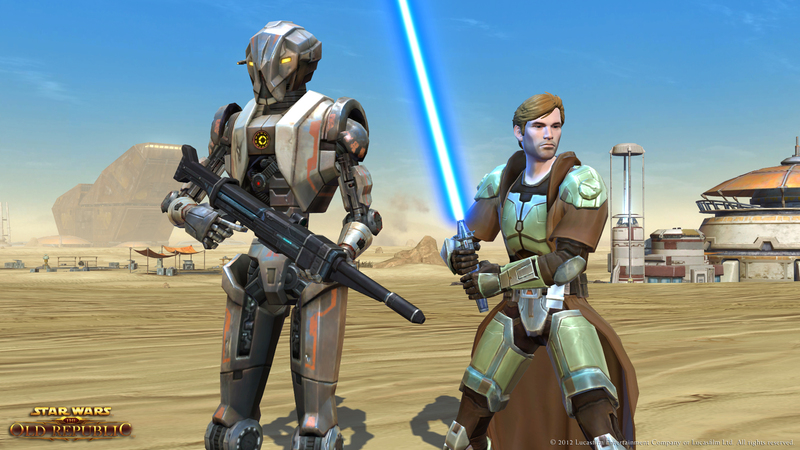 Accumulating points to one extreme or the other can unlock different armor sets that visually reflect the side of the force you reside on. You can be a lightside skewed sith or a darkside skewed Jedi. The different combinations are fun to explore. The game separates players by two factions, the Republic and the Empire. The classes of the Republic are Jedi Knight, Jedi Consular, Smuggler and Trooper. The Empire offers Sith Warrior, Sith Inquisitor, Bounty Hunter and Imperial Agent. At level 10 you come to a fork in the road with each class where you get to choose one of two advanced classes. Each advanced class then has 3 skill trees and can occasionally offer different roles such as 2 of the 3 are damage dealers and the last is a tank. This offers a good bit of customization and differentiation between two players that are playing the same class and same advanced class. A few things that are similar to most MMO’s and things that you really can’t eliminate from them are a lot of standardized quests, “go kill 10 _____ or collect 6 _____ and bring them back to me”. Also equipment slots and special stats on equipment. The harder the enemy the better chance it has to drop loot of a better rarity. It has its version of ‘dungeons and raids’ which I haven’t really participated in. These are things that are at the core of MMO’s and you can’t really fault the game for having. Now to get into the things that I think really stand out in this game and make it wonderfully unique. The three things that I really enjoyed with this game are its story, its crafting system and companions. There are other things that are fun such as having your own ship and with the latest expansion now PVP space battles with said ships, but I have not experience that content so I won’t speak to it here. The legacy system is also a fun addition which puts an emphasis on trying different classes and playing through the game multiple times. You gain perks that you can use across all of your characters. You chose a surname for your entire legacy, it’s a really nice touch. First off, the story. My favorite Star Wars games prior to this were the Knights of the Old Republic games which were made by Bioware and Obsidian Entertainment respectively, who also made this game. The Old Republic is basically KOTOR on steroids. There are 8 different classes so there are 8 different story lines. It is really the heart and soul that made those games great and just put into the space of a massively multiplayer online environment. The game often plays as a very solo experience and I have really played it as such. I haven’t done too many group missions. So it is fair to say that you can play and completely enjoy this game as a solo experience if you just want the feel of a KOTOR. The game is fully voiced which adds so much to the emersion into the story. There are many people from reading the forums who just smash the space bar to skip through the voiced conversations but I think that completely detracts from the experience. Many talented voice actors put in hundreds of hours to make the dialogue really jump out and play a major role in the game, it’s worth taking the time to hear. Next is the crafting system. Something I wish that WoW would completely rip off because I enjoy the mechanics of it so much. The archetypes are still there, you have your gathering professions and your production professions. The game utilizes your companions (to be discussed later) to flesh out the crafting system to not be a mindless grind. You are able to send your companions on scavenging missions to collect materials in order to craft items. It does cost time and credits to send them on these missions, but you can do so while continuing to quest and progress with the story instead of stopping to grind out a few profession levels. You learn many base recipes from the trainers but you also have a chance to learn a rarer version of a recipe each time you craft an item. The other great addition is you can reverse engineer a crafted item to both possibly learn a new recipe and to also get a percentage of the materials used to craft the item back. It really helps with the grind where even tedious tasks with crafting can lead to awesome discoveries. You can use multiple companions to craft and gather at a time as long as they aren’t grouped with you. Last, but definitely not least, is companions. Companions are a fantastic component of the game. They hit on both of the two things I previously talked about with the story and crafting. In the story they help drive through multiple plot lines. With crafting they are an integral part if not the primary piece of the functionality. You are able to form friendships as well as romances from a story point of view, something you would not be surprised to see in a Bioware game. Your interactions don’t normally feel forced with companions, they tend to flow very smoothly with the overall arch of the story. You get many companions over the course of the game each have different specializations and help in different ways. Some of them may help more with crafting while others help more in battle. For those that help more with battle, one may tank and take the brunt of the damage where others may heal you. While they may not be as helpful as another human would be in a group, their AI tends to work pretty well. You do not begin with a companion, you get your around level 8 or so. It’s not uncommon to feel attached to your companions, it makes it easier to feel that role playing component that other MMO’s lack. Overall I have really enjoyed my time in this game. I do not currently have a subscription but since the game has launched it has gone free-to-play. Many of its features still require you to have a subscription or cost Cartel Coins which you can gain while subscribing then use to pay for things later on. I suggest that if you have not tried it and don’t utterly hate MMORPG’s then you should give it a try. You might just get yourself caught up in a galaxy far far away……. Thank you very much for reading this and all of the other articles we have brought to you during Star Wars week and otherwise. Be sure to come check us out on a regular basis and please comment below regarding this article. If you would like to hear more about the game I may be inclined to jump back in for the sake of our readers! Be sure to follow us on Twitter, Facebook and Tumblr. 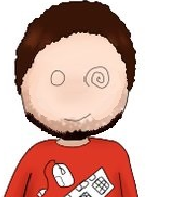 Feel free to e-mail us at theonsgaming@gmail.com. We all here at ONS Gaming want to thank you for visiting our site we hope you will return often! Don’t hesitate to leave comments, suggestions or requests or even questions … down below or at our social medias! Also don’t forget to follow us and help us via likes and shares on any of our mediums to show support you all make it possible! Don’t forget you can always message us here anonymously or email us @ TheONSGaming@Gmail.com or at our individual ONSGaming emails!